QE Scholar Xinxian Qi returned to Nanjing China on September 7th 2018 after three months research at Balsillie School of International Affairs in Waterloo, Canada since June. 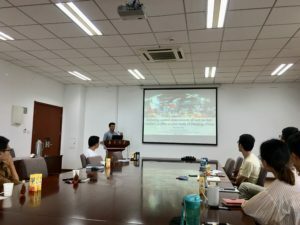 He presented to his colleagues in Nanjing University on his research and life in Waterloo on September 14th 2018. 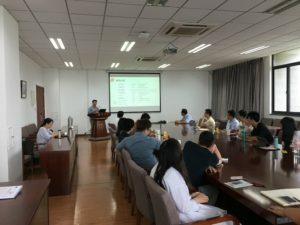 Professor Xianjin Huang, visiting scholar Dr. Zhu Qian from University of Waterloo, and 30 other researchers and students from the research team at the School of Geography and Ocean Science attended the event.